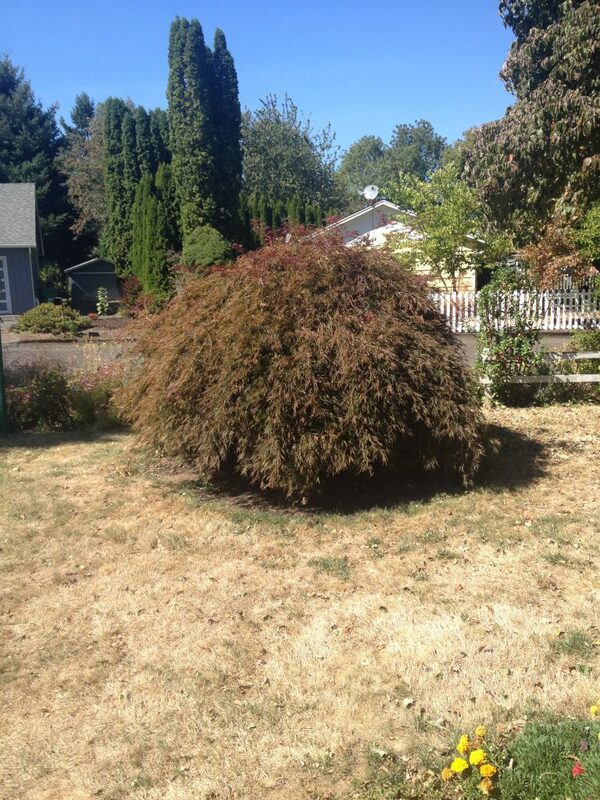 I have two specimen trees that were planted right about when my house was built (1968). They’re in absolutely primo spots in the front yard, visible to all, seen and felt multiple times daily by us and everyone who drives by. They influence my gardening decisions and options very heavily in the front yard. They are a Cornus florida (probably) ‘Cherokee Chief’ and Acer palmatum (probably) ‘Red Dragon’. Unfortunately, I am not in love with either one of them. But what I AM in love with is a challenge. So rather than removing them, I’m determined to work with them. In painting class you never start with a full palette. That would be overwhelming to the first-year student. No, you start with black and white and then introduce one color (usually something like yellow ochre or burnt sienna), and then gradually expand the palette until you have fluency with a full palette. Some painters, myself included, actually prefer a limited palette, though the colors themselves may change from one painting to the next. The Japanese maple especially is exactly this kind of limitation. It’s dark red. It wants to be a blob. I call it “Cousin Itt” and you should have seen it when I first got here. It was a horribly tangled mass of dead sticks and hair (those little leaves and twigs that sprout right out of branches – I call that “hair”). I have been pruning away at this plant for three years now, and today I went at it again. 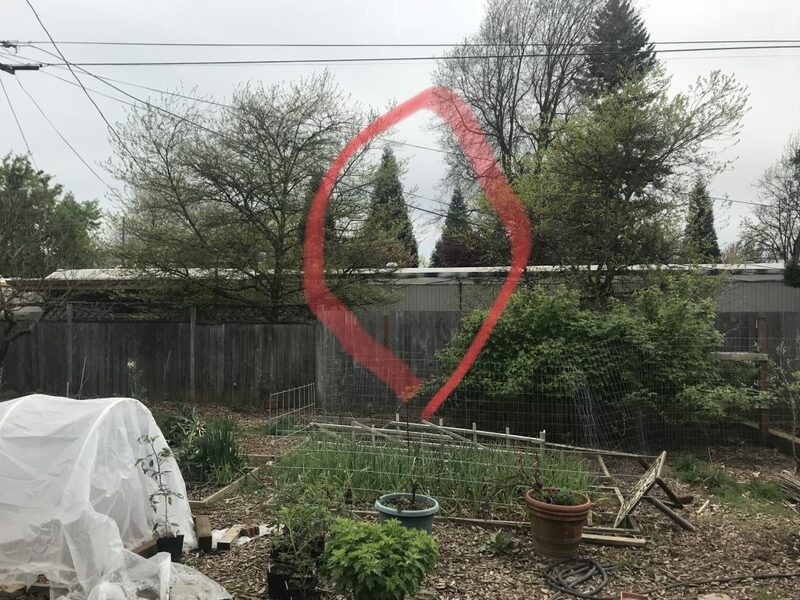 This post documents a more or less typical pruning experience for me most of the time. It happens three or four times a year. Uhh, nerp. This is what it looked like when we first moved in, September 2014. The dogwood is visible up and to the right. Cousin Itt. The gumdrop. Blob. 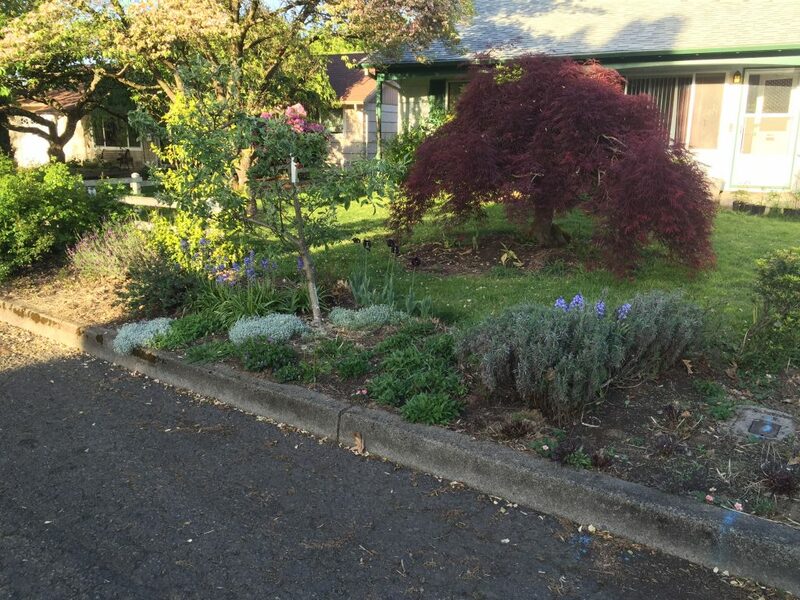 By the way, I did not crop that photo on purpose, because I also wanted you to see the enormity of ridiculous dormant grass, which is no longer (keep scrolling/reading, we’ll get to that too). Here it is from the other side in April of 2015, after I’d attacked it a couple of times. It’s kinda better. My goal with this plant is to encourage asymmetry, establish and maintain multiple tiers, prevent hair, and somehow make it likeable to prevent David from attacking it with a chainsaw (he hated it initially but I think he’s okay with it now). Hair prevention is easy: I just rip them off. The establishment of tiers is more tricky. 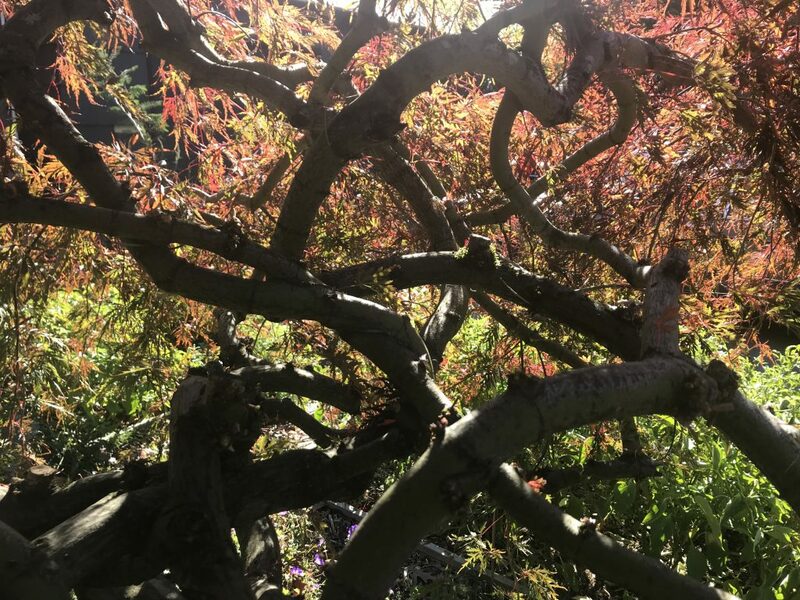 One thing about this maple is that because of decades of no pruning or bad pruning, almost all of its interior branches are overlapping and touching and have become grafted together. This makes larger pruning cuts a bit of a challenge. I have certainly made mistakes. Here it is this morning. You can’t see the branch structure because of all the hair. A bird cannot fly through this. Not even a hummingbird! So the first thing to do is just pull all these little twigs and leafies that are sprouting from larger interior branches. I keep my pruners in my pocket but mostly I don’t need to use them. After, although this is a different angle. Thanks Mr. Sun for the nice lighting effects! 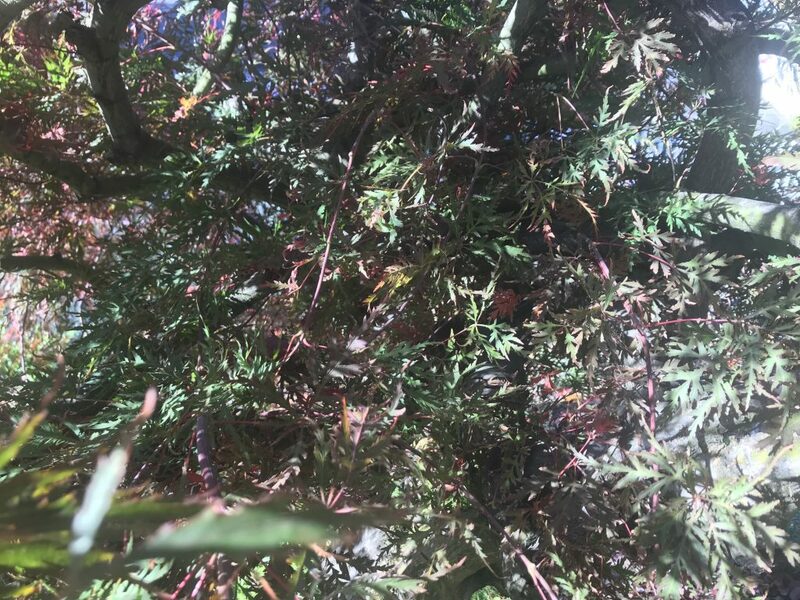 For the tiers, since I’ve already decided where the tiers are (that got established the first time I pruned it, more or less), all I need to do is identify individual branches/shoots that originate in any given tier and descend down past their tier into the next one, and prune or remove them. Or if it’s a lowest tier, those that touch the ground get pruned. Depending on what’s going on, I might prune it part way or all the way. The other thing these maples do is what I think of as “redundancy.” That’s when, say, it already has what I think is an adequate amount of growth in an area, and then it makes three new branchlets right in the same area, often going the same direction, right on top or underneath what’s already there. In these situations I prune pretty carefully because hey! the new stuff might actually be more desirable than the original stuff. Just like in painting you have to step back and look at your work from a distance, and frequently. Nevermind the maple for a sec, just check out my neighbor’s Liriodendron! I like how the dogwood looks in front of it. Fall colors have been spectacular this year, haven’t they? 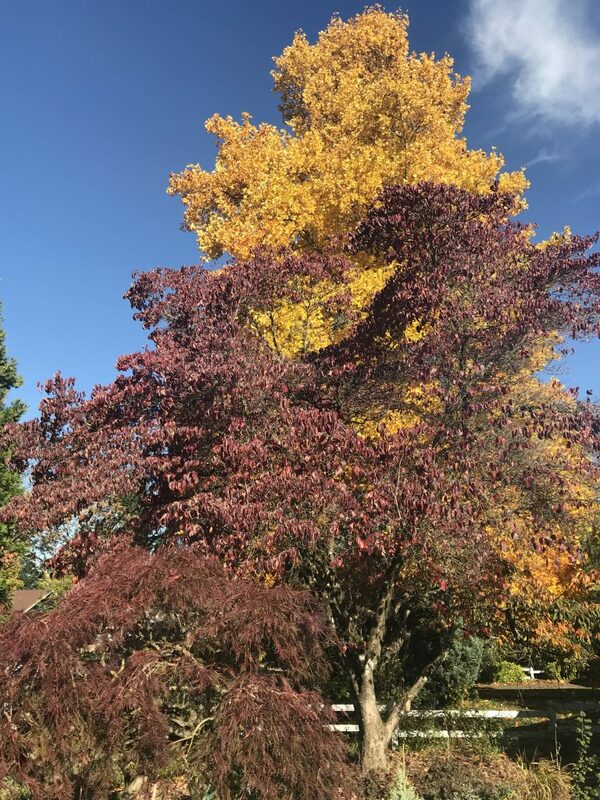 Oh look, right at the bottom of this picture just to the right of the dogwood’s trunk you can *just* see the top of a little Cupressus glabra ‘Sulphurea’ I recently picked up from Xera Plants which is a very dangerously short drive from me. 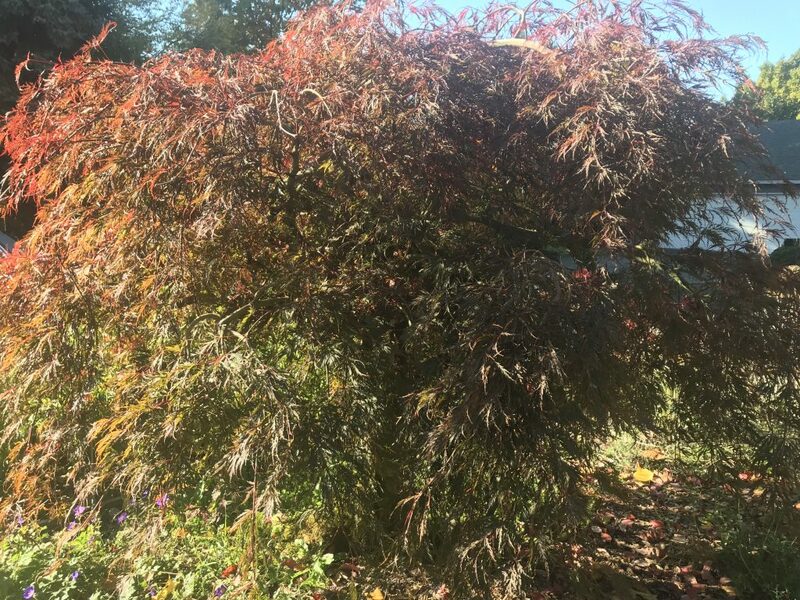 I’ve been looking for something with either chartreuse or silver/blue foliage to plant right next to this maple and sort of mess with it a little, break it out of its blobbiness. This awesome cypress has both of those colors! I don’t know if this plan will work, or it’ll just make it harder to prune the maple, but I’m gonna try it. See all the other plants in pots? Not counting the gerberas down in front (they always live in pots), there are actually 8 in this photo, all of which will go in the ground this week. That’s about 1/4 of the total I have collected in the last couple months – and that is what I mean by a dangerously short drive. And now you also see what the grass has been replaced with, at least currently. There are two rectangular 4 x 10′ beds here that I use for vegetables. 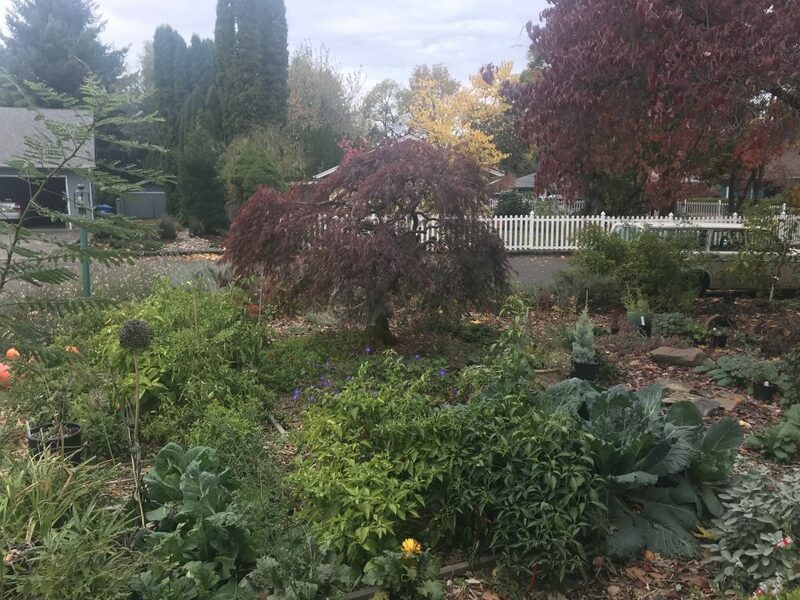 The bed to the left of the maple (we are looking east here) is the sunniest spot on the property so it’s really great for peppers and eggplants although I might do watermelon here next year, because it’s pretty. And silvery. I think it’s getting there. The branch structure isn’t great on this one, but all of that was before my time. I like thinking of this as an ongoing sculpture collaboration with the tree. And I think a sparrow could certainly get through there.